As I enter Bruce and Meredith’s large Eltham garden, I immediately realise that this is a place to spend at least a day, with Meredith’s fabulous ceramic sculptures at every turn and the largest urban veggie garden I have ever seen. Before I met Bruce and Meredith, I knew them as the owners of Bulleen Art and Garden (BAAG) nursery, where Meredith also runs the art gallery. In addition, Bruce is the erstwhile President of Sustainable Gardening Australia (SGA), so their passion and interest in these fields is significant. We have tea and freshly-baked warm cake at a large, outdoor table with unusual curly iron backed timber chairs, whilst Bruce and Meredith tell their garden story. Bruce comes from a farming background and recalls his mother growing many fruit and veggies. Having been through the Depression years, his mother was used to growing food to survive. 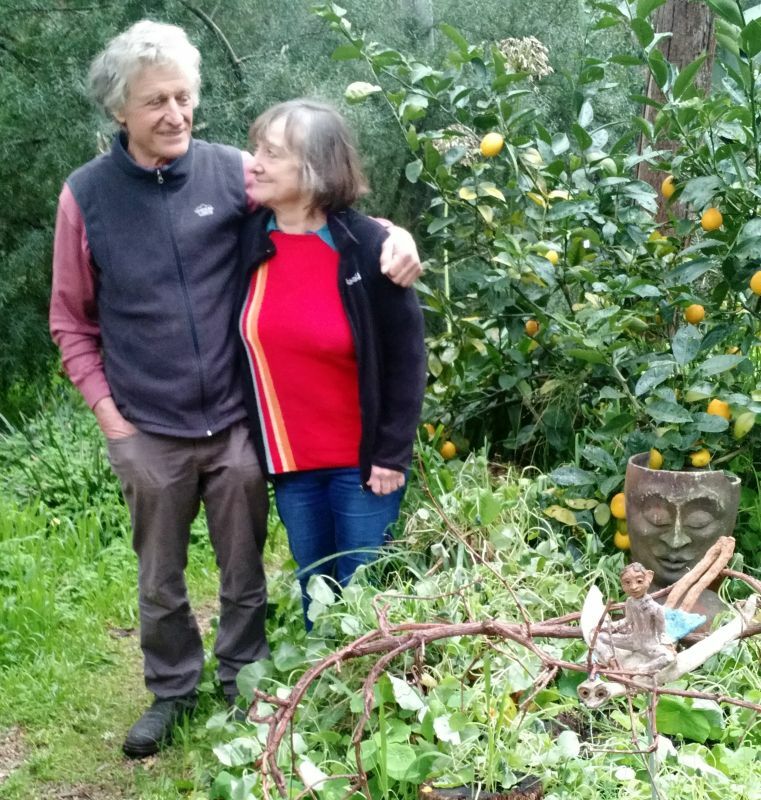 From Bruce and Meredith’s time in Fitzroy over 30 years ago, they always had a small, basic veggie patch and this continued when they moved to Eltham, being particularly good for their children when young to connect them with the fun of growing food. Today, their three grandchildren enjoy picking fruit from the forty odd fruit and nut trees on the property and hiding in the ‘bean cave’ made by the climbing beans when in season. Both Meredith and Bruce spend considerable time with their grandchildren in the garden so that the children can experience a natural environment. 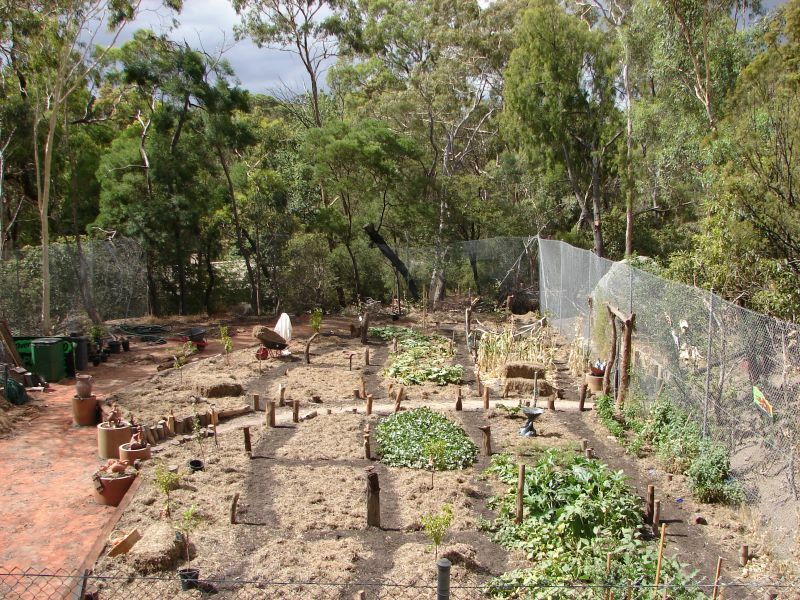 Bruce and Meredith’s Eltham property had previously been owned by a person who had enjoyed gardening but, whilst it was a bush block with Australian natives, there was no veggie patch. 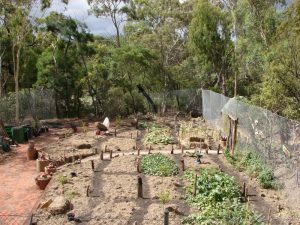 So in 2009, Bruce and Meredith set about digging up the existing tennis court to create a large veggie garden, to replace their previously created smaller one. They also planted a significant number of fruit and nut trees, interspersed through the front garden, plus around and inside the tennis court area. Digging up the tennis court was a big task tackled in sections, with the en tout cas clay surface being mixed with around 100 cubic metres of soil fill, organic matter and sandy loam. With a background in landscape construction, Bruce did the design plan and also organised soil testing to check soil composition. Whilst soil testing is a cost, Bruce says that it pays for itself in the long run, as knowing what is already there helps manage and reduce the materials needed for the garden. Meredith estimates that around 2 inches of cow manure is added to the veggie garden every year, plus loads of home-produced compost. The garden has been so productive that Meredith bought virtually no veggies the first few years onwards and, whilst Meredith has recently supplemented with external produce, they try to eat seasonally. With the fruit trees growing larger, preserving is becoming necessary and bowls full of berries are picked. The tennis court fencing remains in places and hosts a large passionfruit and choko, with the large garden beds currently growing numerous winter veggies. 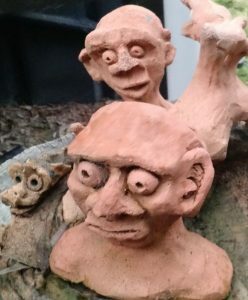 Bruce and Meredith say they are not sticklers for garden tidiness and Bruce, in particular, likes to put his efforts into a productive rather than a tidy outcome. Both believe that it is common sense to give nature the opportunity to be in control of its own future. 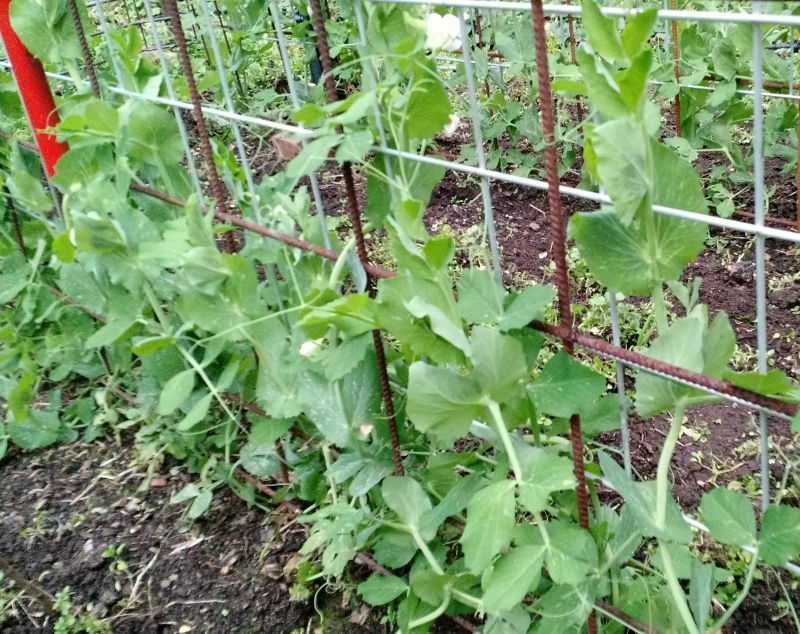 However, they have slightly different limits on how far they are prepared to go to achieve this approach to gardening – Meredith is less accepting of a tangled mess of weeds! 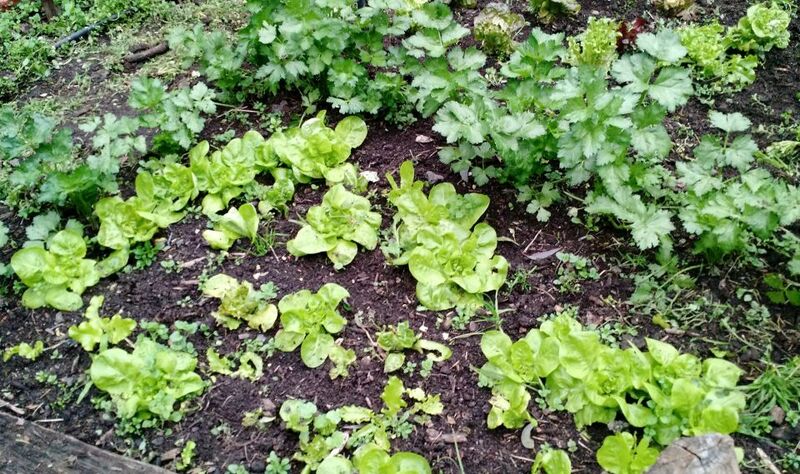 Bruce does not believe in interfering in the natural processes in a garden if you make a commitment to that small bit of dirt for at least decade … unless there is good reason, such as sustainable food production. Both Meredith and Bruce believe that the beauty of nature is in its wildness, not the extent to which humanity can control it. For example, Bruce prefers not to mow the grass except for fire and snake danger – the beauty of the grass is seeing it sway in the wind and the complex life it can support – not having it standing clipped, perfectly groomed and obediently at attention. If people were prepared to spend a minute a day looking at a single blade of un-mown grass and reflecting on the number of micro-organisms it supports, our lives might be more fulfilling and the world a better place. Bruce thinks that whenever people interfere with natural systems they invariable do more damage than good regardless of how good their intentions are. Respecting nature and trusting it to work itself out – even if we, as part of nature, have caused interference – is the best way to go. Due to the continuous wear and tear on his back, Bruce decided to give up landscaping construction and many years ago, having previously set up Fitzroy Nursery, bought Bulleen Art and Garden (BAAG). BAAG caters for people who love plants, in particular, ‘produce’ (food) plants. Some twenty years ago, Bruce found that the Italian and Greek community were the main buyers of such plants but the popularity of food growing has now expanded considerably as people all over have been inspired to grow their own food. This includes people with block sizes large enough to grow such plants, as well as those with balconies and courtyards wanting to garden using containers and pots. Meredith, a ceramic sculptor, runs the gallery at BAAG. As well as selling what she creates through the gallery, Meredith also holds workshops in her craft and organises other workshops in mosaics, stone and the like. 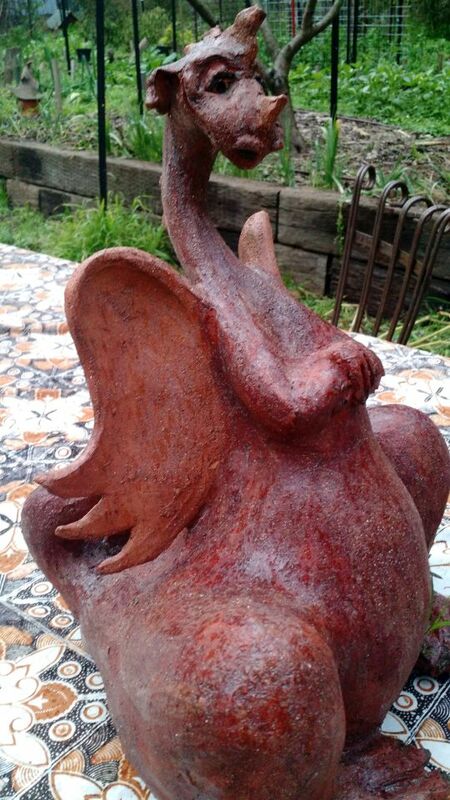 Initially a medical researcher, Meredith started working with clay when their children were young, commencing at the Living and Learning Centre then later a Box Hill TAFE course. Dragons and numerous clay animals and creatures are abundant in Bruce and Meredith’s garden, as well as other sculptures and garden art. To take it all in on my one hour visit is difficult, as there is just so much to look at and admire. 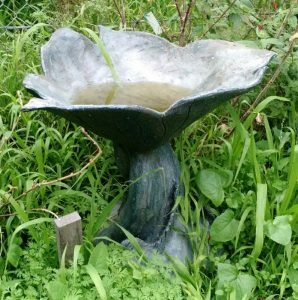 Nothing is ‘ordinary’ – even the birdbaths have a spectacular design and are a work of art. In addition, Meredith and Bruce have 17 nesting boxes in their garden, to encourage the wild life. Sugar gliders and bats are some of the animals that make use of these – a nesting box designed and located specifically for powerful owls has instead attracted wood ducks! Bruce’s philosophy is that you feel better about yourself if you are connected with nature. Looking at a magpie searching for food in the garden, Bruce remarks that we are no different and that it’s good to get involved in the production of your own food – you also become more aware of birdlife and tolerant of it. With more people choosing to live in apartments, Bruce is concerned we may become disconnected from the land and how food is grown, so he is keen to encourage balcony gardens. Bruce is complementary of the work done by Local Food Connect (LFC) in creating a local food growing and eating culture and enjoys the information provided on the website and via the LFC newsletter. As well as time spent with the grandchildren, today Bruce also volunteers a significant 70% of his time to Sustainable Gardening Australia (SGA) – a not for profit organisation “dedicated to achieving a healthy biodiverse planet and vibrant, sustainable communities”, where Bruce is the President. Bruce is particularly proud of SGA’s achievements in assessing the impact of gardening products on the environment, giving over one thousand gardening products a rating out of six stars. This gives both home gardeners and trades’ people the knowledge and encouragement to shift from environmentally damaging products to those with less environmental impact. A challenge for Meredith and Bruce’s garden has been the disease build up over time and ways to manage it. Regularly they walk through their garden, even if it’s only for 20 minutes, to check what’s happening to the plants. They plan to become more methodical with crop rotation; this will involve numbering the garden beds and noting what’s where – making a plan in advance of how the rotation will work. This can become difficult with plants like tomatoes – where to put them next year when you always want to grow lots of them. Both Bruce and Meredith acknowledge that they will lose an amount of their crops to pest damage, however still manage to get significant productivity. Where necessary, Neem Oil and eco-friendly snail bait are used. 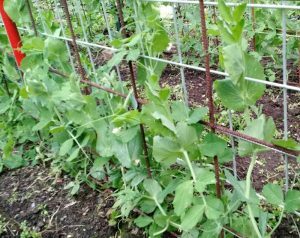 Bruce estimates that it will be another ten years before their garden is fully productive and the rhythms are how they would like. It is very much a ‘work in progress’ garden, by some busy people, including a son and daughter in law, with a trust in nature to help drive the process. 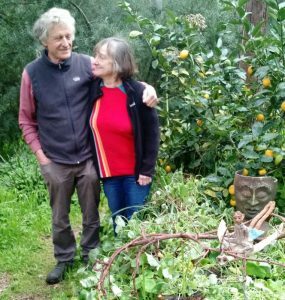 Based on how far they have come to date, it follows that Bruce and Meredith’s garden will continue to be delight for many years … to explore, learn from, contemplate and simply spend a while. Hi Bruce & Meredith. Congratulations on a lifetime achievement following a passion that was evident many years ago when we were friends in the ’70. Great to hear your story. Best regards John & Cheryl Joyce, Wangaratta. Wonderful article on some truly inspiring people. 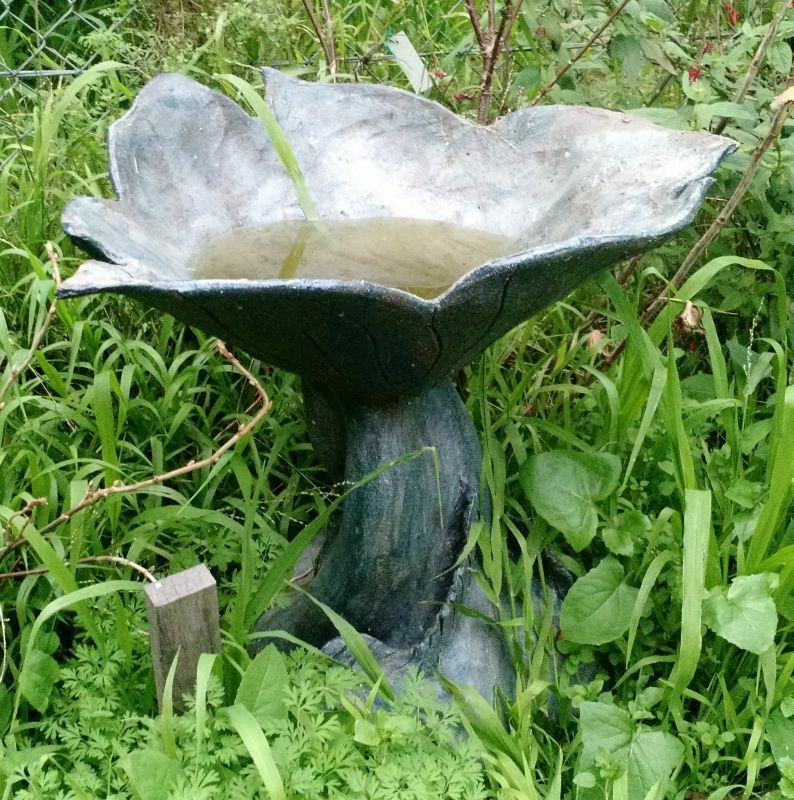 Their garden is absolutely amazing and Bulleen Art and Garden is an amazing place. No other place in Australia quite like them. Victoria is lucky to have such a legacy. I have been a secret admirer of Bruce and Meredith for a very long time. This interview confirms my respect for their work and who they are. Helen, you are so good with your interview styles and write up. Thank you for that and thank you for sharing. Fantastic and inspiring. Thanks for sharing ! Thanks for the interview with Bruce and Meredith. It was good to learn more about their thoughts and feelings on gardening and relating to the natural world. They seem like the perfect people to be running Bulleen Art and Garden nursery. I was there recently, but now, knowing who the owners are, and their credentials, makes a visit even more worthwhile!